To prevent other users from viewing hidden worksheets, adding, moving, deleting, or hiding worksheets, and renaming worksheets, you can protect the structure of your Excel workbook with a password. To lock your file so that other users can't open it, see Protect an Excel file. To protect certain areas of the data in your worksheet from other users, you have to protect your worksheet. For more information, see Protect a worksheet. To know the difference between protecting your Excel file, workbook, or a worksheet, see Protection and security in Excel. Click Review > Protect Workbook. Note: The Windows option is available only in Excel 2007, Excel 2010, Excel for Mac 2011, and Excel 2016 for Mac. Select the Windows option if you want to prevent users from moving, resizing, or closing the workbook window, or hide/unhide windows. Enter a password in the Password box. The password is optional. If you do not supply a password, any user can unprotect and change the workbook. If you do enter a password, make sure that you choose a password that is easy to remember. Write your passwords down and store them someplace safe. If you lose them, Excel cannot recover them for you. Passwords in Excel for Mac have a 15-character limit. You cannot open a workbook or document that has been password-protected in the Windows-based version of Excel or if the password is longer than fifteen characters. If you want to open the file in Excel for Mac, ask the Windows-based author to adjust the password length. In Excel for Windows, click OK, and retype the password to confirm it, and then click OK. In Excel for Mac, retype the password and click OK.
How can I tell if a workbook is protected? On the Review tab , see the Protect Workbook icon. If it’s highlighted, then the workbook is protected. 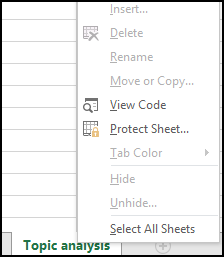 If you click on the bottom of a sheet inside your workbook, you will notice that the options to change the workbook structure, such as Insert, Delete, Rename, Move, Copy, Hide, and Unhide sheets are all unavailable. 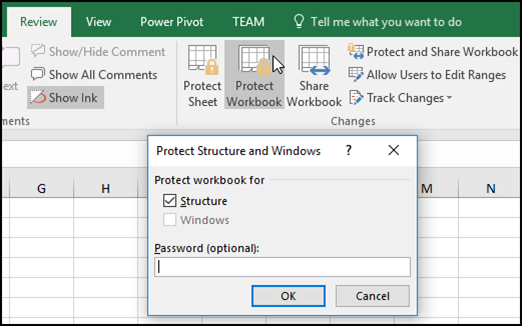 Additionally, in Excel for Windows, the Protect Workbook option in the Info menu also indicates that the workbook's structure is protected. To view this option, click File > Info > Protect Workbook. Click Review > Protect Workbook. Enter the password and then click OK.